GameTwist Casino has been in the online gambling market for some time now. It was established way back in 2002 and has ever since charmed gambling enthusiasts with its peculiar traits and generous features and characteristics. Besides, it is the creation of Funstage Spielewenseiten Betriebsges.m.b.H. When it comes to graphics, GameTwist Casino has a pretty interesting style and 3D art features that add to the excitement of the users while gambling. The sound effects and graphics are electric and immediately transport you from the couches and busses to the real gambling world. Another striking feature is that players can link up with their friends on Facebook to boast of their wins and gains. You never know, you might even receive some gifts or surprises for doing so. Even though this casino has been on the market for quite some time now, don’t be fooled into thinking that this site is cold and stale, or even worse, outdated. The options available here are frequently updated, and its services are impeccable. Besides, GameTwist online casino is operable on the computer, smartphones and tablets, thus making gambling all the way more convenient for punters. On either of the platforms, users can gamble while enjoying a top-notch uncompromised visual and audio quality. Android and Apple devices fully support GameTwist app and mobile casino website. The games on GameTwist are provided by some of the most reputable providers in this industry like Novomatic and its auxiliary, Greentube (they power some of the finest casinos like Fortunejack). Novomatic games are a fan favourite, and they use a generator that churns out numbers randomly (also known as Random Number Generator or RNG). The RNG is also evaluated and assessed by iGaming. Some games of GameTwist are also produced by Genesis Gaming. This is a unique website, and if you want to gamble for fun without feeling the pressure or the risks associated with gambling for real money, this is the right place. GameTwist is a themed casino and offers up to 200+ games of practically all categories from slots, table games to skill games. It takes almost every measure to make gambling a smooth and enjoyable event. The platform is pretty and dazzling and automatically woos the gamblers to find their way into this world of free and fun betting. It is available across all platforms from desktop to mobile. In addition, it supports a wide range of languages and currencies including bitcoins. GameTwist has an enormous library of betting rounds that cater to all sorts of players all around the world. The quests are themed and interesting to try. Slots. GameTwist is home to 214 slots. It seems like users will never run out of slots to enjoy. Some of these slots are Amazon’s Diamonds, Arctic Race, Blazing Jolly, Island Heat, Apollo God of the Sun, Dragon Warrior, Wild Country, Mystic Secrets, Shooting Stars, Pirates, Ocean Tale, etc. The ultimate fun and popular slot available here is Sizzling Hot Deluxe which can be played for free here provided you have an adequate number of twists in your account. Bingo. There are nearly 10 bingo games at GameTwist Casino like Keno+2Ball, Lucky Lady Bingo, Autodromo Bingo, 1-2-3 Bingo!, Bruno Bingo, Bingo 10, Scratch & Go Bingo, and Book of Ra Deluxe Bingo. Poker. Grand Hold’em and Live Poker are among the 8 poker options available here. Video Poker. There are some video pokers like Deuces Wild and Jacks or Better. Table Games. There are as many as 11 table games available here with varieties of roulette, baccarat, and blackjack. Skill Games. There are around 16 quests pertaining to this category. They are namely: Rummy, Tarneeb, Battlefleet, Solitaire, Yatzy Live, Buraco, Canasta, Belote, Prophet, Scopa, Pachisi, Hearts, Spite and Malice, Rummyclub, 4-to-Win, and Backgammon. In addition to all these, this platform also contains a few scratch card games. The free online GameTwist games contain the Spectator mode, which is similar to the demo option. Using this feature, users can try the offerings without the need of purchasing or buying twists right away. The options are quick to respond, and no review has reported of any malfunction while trying them out. 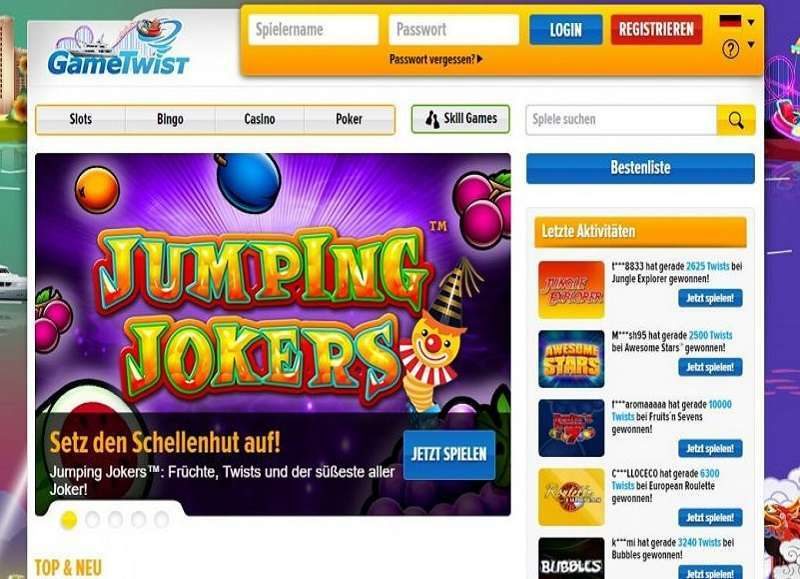 What makes GameTwist all the more popular with gambling enthusiast is its Live Casino. 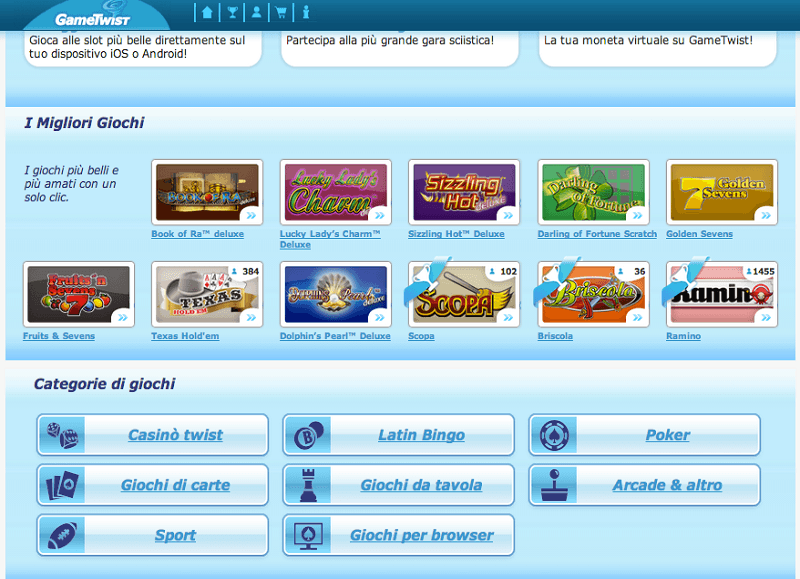 Here, the users can gamble and communicate with other bettors all over the world at any time of the day. The games available at GameTwist live casino are Live Roulette, Live Poker, Live Knobeln, Live Blackjack, and Live Baccarat. Hence, the users can experience the ultimate flavours of gambling from the comfort of their homes. 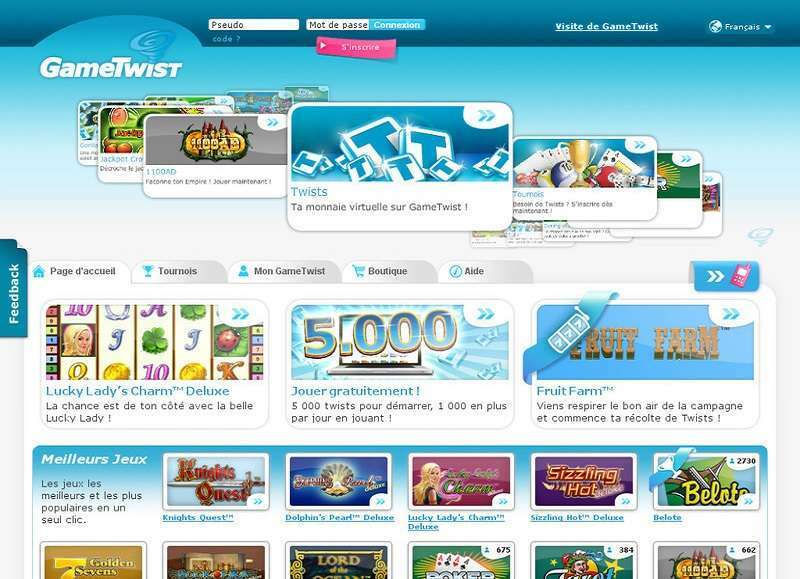 The first bonus that a user receives is merely for registration with GameTwist. It can be considered as GameTwist’s no deposit Welcome Bonus which earns one as many as 3,000 promotional twists and 15 FS. The Daily Bonus appears almost regularly, and you can never say what’s in store for you so keep an eye out and don’t miss out. The Claim Bonus Button on the right bottom of the screen, upon activation, yields the Periodic Bonus. Upon clicking, users can get up to 20 to 100 twists or even more. On subscription to the GameTwist Casino newsletter, it will let you know of special vouchers due to which you can get free twists. These twists can be cashed in on the Redeem Voucher Section of the GameTwist account dashboard. GameTwist frequently organises many competitions and tournaments, and by participating in these, you can earn free twists and rewards as well as level-ups which in turn are again very rewarding. GameTwist Casino has a VIP program with an XP point system. Here, the customers are granted experience points or XP points for performing certain activities. The XP points can be exchanged for “a host of rewards”. But these rewards will reveal themselves as surprises. The system is kind of vague as there is no clear indication of the rewards or benefits. So the users have pretty much to figure out by themselves. A major fact is that the wagering of odd rounds of gambling is done for free. 1 Account Registration: How to Get Started? Account Registration: How to Get Started? Enter your username, mail id, and password. Within a few seconds of completing your form, your account will be activated. Click on the email verification button or link. Immediately, you will be brought to a page where you will be asked to enter your birth-date and respond to some security questions. Enter the details required and you are all good to go! Bitcoin expenses are carried out through Cubits. As said before, the twists on this casino can’t be converted into real money and withdrawn by the user. It’s more like gambling with play money rather than real money. But this being said, it is noteworthy that purchasing twists is not mandatory since, in the very beginning, punters are given a minimum of 3,000 twists. Also, players are given free twists regularly. GameTwist Casino has a superbly efficient customer helpline, but it can be contacted mainly by email. Inquiries, appeals and assistance are looked into immediately and responded with great speed. Users can also head over to the FAQ section to drop in enquires and get their doubts cleared. Gambling with play money has its perks after all. Like, for instance, almost everybody anywhere in the world can gamble at GameTwist. Exciting enough? This is because it does not have actual wagering and hence don’t violate the anti-betting laws of various countries. And therefore, GameTwist Casino supports an extensive array of languages and the following currencies along with bitcoins. Unlike most of the other gambling websites in the market, GameTwist brings forth to its punters an app that can be accessed by both Android and iOS users. Not many other real money betting platforms offer its users this feature. This app is totally harmonious with iPads. iPhones and Android-based apps and can be downloaded on the Google Play Store and Apple Store for free. Besides, the app is multi-lingual and hence appeals to gamblers from all over the world. The app doesn’t lack any of the services or quests that are provided on the instant play software available on the website. Purchasing packs of twists are easy and not any different from purchasing them on the computer. Also, the punters are entitled to bonus credits and other exciting offers for signing up with GameTwist. The app comes for free, and it also allows the users to make purchases on the app. The casino app allows the users to download various gamesavailable. Hence, make sure that you have enough memory on your device. After a stressful day, you can always come back home and enjoy this casual and dazzling gaming platform since GameTwist is simple to operate. Thus, this multi-themed casino is a must try because it is one of those few gambling sites that permit players from all countries worldwide with no restrictions. It also comes with a downloadable app which is very proficient. You don’t have to stress over its safety or doubt its legitimacy. If you are looking for some care-free gambling, GameTwist is the ideal site, and it would be foolishness to miss out on this site. Its wide range of betting roptions has something for everybody, and if you are a slots lover you are in for a treat. GameTwist slots are slots lovers’ favourite. So don’t shilly-shally or dilly-dally any longer and dive in into this unrealistic world of gambling. Try it, and you will not be disappointed. Good luck! I learned about the GameTwist Casino last year, and it was very strange. Gambling for years, I never knew about it. Now, I visit it pretty often - once a week at least. Although I understand that the site design does not play a great role, it is pleasant to visit this resource - the picture of the pyramids and sands remind me the country which I often visit, Egypt. The newbie will like the casino's welcome bonus, which consists of twists. The only one minus (for me) in no live chat, which is not so convenient. The beginners often need some prompts.